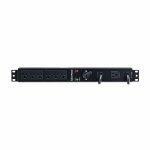 Designed for data centers and other locations where uptime is critical, CyberPower Maintenance Bypass PDUs allow the seamless transfer of an electrical load from UPS power to utility power for uninterrupted operation of connected equipment when performing maintenance, replacing batteries, or installing a new UPS. The 6-foot AC cord of each Maintenance Bypass PDU (MBP) connects to utility power. A 3.3-foot AC cord connects to the output power of the UPS. The UPS draws input power from the MBP through a dedicated receptacle which is separate from the outlets for connected devices. When the switch on the front of the MBP is turned from Normal to Bypass, or from Bypass to Normal, the power supplied to connected devices moves from one input power source to another. A LED display indicates which power source is active. Rugged, industrial-grade metal housing protects the Maintenance Bypass PDUs. With a 1U form factor, each model can be mounted in a standard server rack. The mounting hardware also enables an MBP to be connected to a UPS for tower configurations. Each Maintenance Bypass PDU comes with a Three-Year Limited Warranty and a Connected Equipment Guarantee.